Positive Displacement Blowers Market size was more than USD 2 billion in 2017 and will witness 6.0% CAGR during the forecast timespan. Growing water & wastewater treatment industry shall be a prime factor responsible for fueling positive displacement blowers (rotary lobe blowers) market in the coming years. With global economic growth natural water resources are experiencing high pressure demand from agricultural as well as industrial applications. Agriculture, industries and domestic households are three key users of water. Agriculture accounts for close to 70% of global water consumption, followed by industries (20%) and domestic (10%) respectively. With increasing population and thereby rising water consumption, there will be huge water crisis in the near future. Thus, water recycling has gained prominence across all major economies of the globe in past few years. Oil & gas and petrochemical industry are prime end-users of rotary lobe blowers. Rising shale oil & gas exploration projects in the U.S. will be propelling product demand over the next few years. The product is extensively used in VOC recovery, pipeline boosting, natural gas compression and underground gas storage in oil & gas conveyance and storage. 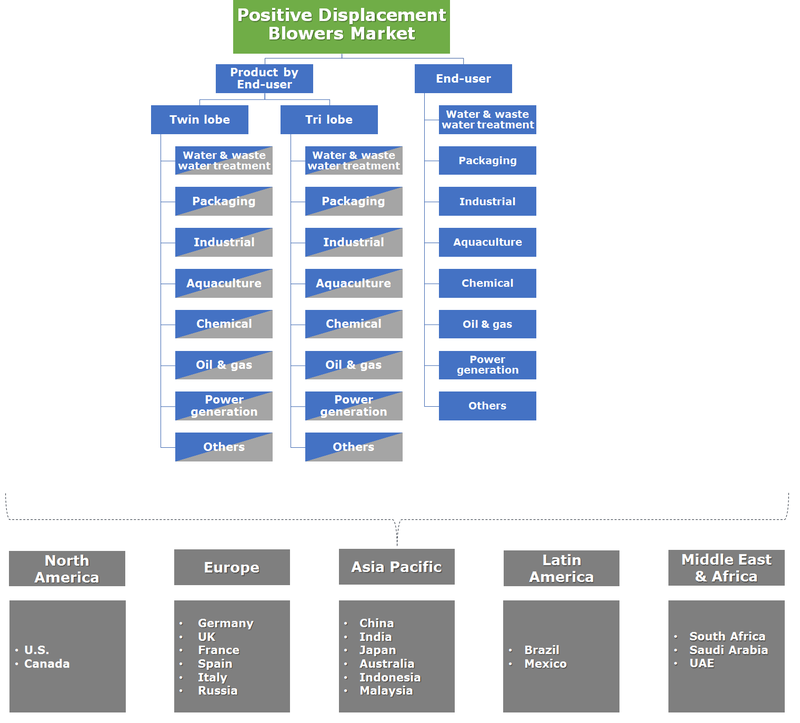 Rapid industrialization in Asia Pacific has encouraged numerous chemical manufacturing companies to setup their production facilities in countries including Vietnam, Bangladesh, India, South Korea, Sri Lanka and Indonesia owing to cost effective labor and low-cost raw materials. 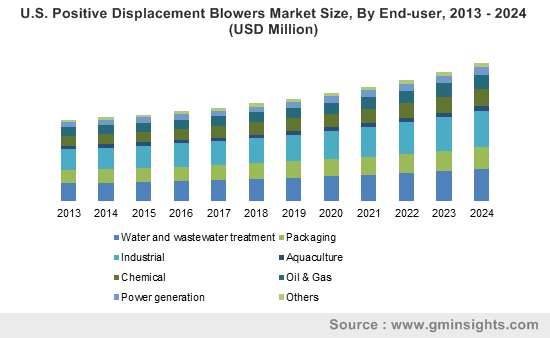 Positive displacement blowers market in this region shall benefit from growth in chemical industries. Asia Pacific has abundant small and medium scale rotary lobe blowers manufacturers and the market here is highly unorganized. Thus, there’s immense growth potential for rotary lobe blowers market over the forecast timeframe. Rotary lobe blowers market is highly regulated by energy agencies. A high-performance rotary lobe blower saves energy, reduces noise pollution and thus improves overall efficiency of the process. Hence, blower design specifications are set by agencies such as Department of Energy, U.S. to regulate the energy consumption and thus deliver desired performance. Tri lobe or three lobe positive displacement blowers is likely to be witnessing prominent gains in global rotary blowers market over the forecast timeframe. The three-lobe design facilitates lower noise levels with higher reliability due to longer life and reduced service intervals. Twin lobe positive displacement blowers held the largest share in global rotary lobe blowers market in 2017. This can be attributed to its plain design and easy availability in market. Additionally, these are less expensive than tri-lobe positive displacement blowers. Two lobe rotary blowers are used in water aeration, grain conditioning, dust collection, textile drying and other similar applications. The rotary lobe blowers market by end-user was led by industrial applications in terms of volume and value in 2017. Processed air is an essential part of industries. Thus, with positive displacement blowers, it is makes processes such as hydrogen generation, air separation and coolants processing more convenient. Pneumatic conveying is a prime application of rotary lobe blowers and this type of conveying facilitates various industrial operations. Oil & gas industry is also a prominent end-user of positive displacement blowers. The product is used for catalytic cracking, hydrocracking, fractioning and reforming. In chemical processing, the product is used for gas conveyance of gases including acetylene, hydrogen, ethylene, vinyl chloride, synthesis raw gas, hydrogen sulphide and lime kiln gas. Water & wastewater treatment will be the fastest growing segment in global rotary lobe blowers market during the forecast period. Effluent/ sewage treatment is a process of contaminants removal from waste water which includes majorly domestic sewage water and industrial effluents. In this process, blower air is an essential part of the water treatment plant, which is provided by these two/three lobe rotary blowers. The integration of positive displacement blower systems with effluent treatment plants is cost saving, energy efficient coupled with increased performance. Asia Pacific accounted for the largest share in global rotary lobe blowers market, both in terms of volume and revenue in 2017. Wastewater treatment is a major concern in Asia Pacific, which is riding high on industrialization wave since past two decades. China, India, Japan are some of the key centers of economic development majorly through manufacturing and other chemical factories setup. Thus, wastewater treatment has always been a rising concern for governments in these nations. For instance, the Chinese government in its 12th Five Year Plan, has allocated approximately USD 110 billion per year to environmental protection and pollution control which primarily includes solid waste and wastewater treatment. These initiatives plus a number of other policies adopted by governments to treat domestic and industrial waste water to replenish existing water resources, shall be accelerating product demand across the globe over the forecast period. Europe was another prominent region in global positive displacement blowers market in 2017. It is due to the presence of companies such as Aerzen, Kaeser Kompressoren, HR Blowers having their manufacturing facilities in this region. The positive displacement blowers market comprises of global players and local small-medium scale manufacturers. Aerzen, Busch SE, Gardner Denver, Eurus Blowers and Hitachi are some of the established multinational players which have years of experience in the market with their globally accepted brands along with a deep-rooted extensive distribution network. Technological innovations are an integral part of these organizations and they spend massive amounts in improving the overall efficiencies of the product. Strategic acquisitions play an important role in business expansion in positive displacement blowers industry. For instance, in December 2011, Gardner Denver acquired Robuschi S.p.A. for USD 200 million. Robuschi is an Italy based leading manufacturer of blowers and pumps with annual revenue of approximately USD 92 million. Positive displacement blowers are oil-free machines that push a relatively constant volume of the gas handled at the inlet through to the discharge. These machines utilize positive displacement technique by trapping specific volume of air and then discharging it out against the system pressure. The product has diverse range of applications in oil & gas, chemicals processing, packaging and wastewater treatment industries. It is also largely employed in pneumatic conveying which is a major process in food processing, pharmaceutical and chemical industries.